Other Distinguishing Features: Sharp haircut and orange shirt. When Chicago Bull attacks the Freak Outpost, Charlie Triumph is one of many members at the location. 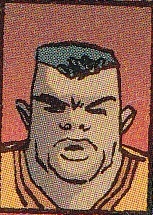 Later when CyberFace announces his reign as leader of the Vicious Circle, Charlie Triumph is one of many in attendance. He is also one of the many super-freaks who brutally beat Dragon in prison. During Dart’s attack on the prision Charlie is killed by the Dreadheads trying to quell the riot.